Watch Where You Put That Snow! As cities in the Northeast dig out from a powerful winter storm, many are using local rivers to dump tons of plowed snow that doesn't fit in parking lots or other urban spaces. Some scientists say the river dumping carries an environmental risk. In Pennsylvania, for example, the accumulated snow could harm a sensitive insect species at the bottom of the food chain. Robert East Jr., a biologist and director of environmental studies at Washington & Jefferson College in Washington, Pa., said stone flies — just beginning to emerge in Pennsylvania's rivers — could be threatened by the salts used to melt snow along the state's roadways. "They're very sensitive to water quality, so any sort of pollution that they experience now — nitrates, phosphates, chlorides, salts — could devastate them," East said. "These organisms are important as part of the food chain in the streams. They break down leaves, they provide organic matter, and they're also part of the food chain for trout, large mouth bass, a lot of our game fish." With little space to pile accumulated snow, Philadelphia officials decided to dump it into the city's rivers. Christine Ottow, a spokeswoman for Philadelphia's mayor's office, called dumping the snow in the river a "last resort." The city was buried under 18 inches of snow in this week's storm. "But in this case it's just too much," Ottow said. "And if we don't get it out of here, when it starts to melt we'll have flooding — in which case we'd probably have runoff going in anyway." While Pennsylvania and West Virginia have no rules that prohibit dumping snow into rivers and streams, other states do, including Maryland and Massachusetts. New Jersey also prohibits dumping, but the ban was temporarily lifted after Gov. James E. McGreevey declared a state of emergency following the storm. 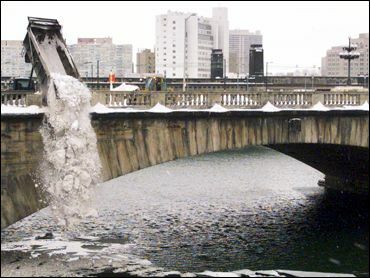 New Jersey Department of Environmental Protection spokesman Al Ivany said Paterson, Jersey City, Newark and Stockton all received permission to dump snow into rivers. Likewise, the Massachusetts Department of Environmental Protection granted a waiver to the Coast Guard to dump snow from its base into Boston Harbor. "It's a confined area, and they have good control over what they have on the base itself (to treat snow)," said Massachusetts DEP spokesman Ed Coletta. In New York City, Department of Sanitation spokesman Vito Turso said the department stopped dumping snow into the East and Hudson rivers and New York harbor after a 1996 blizzard because of worries over pollution from rock salt and debris. River and watershed groups said snow should be hauled away. "Our preference is for this stuff to be dumped on open land where it can at least not go directly into rivers," said Tom Miner, executive director of the Connecticut River Watershed Council in Greenfield, Mass. But Dennis Buterbaugh, spokesman for the Pennsylvania Department of Environmental Protection, said rivers typically are higher in the winter and better able to handle additional salt levels. Dale Bruns, professor of geoenvironmental sciences at Wilkes University in Wilkes-Barre, Pa., said taking the snow to larger rivers, such as the Susquehanna or the Schuylkill in Pennsylvania, might mitigate the threat from the high chloride levels. "In Pennsylvania, a lot of our roads go right along the stream, and with a normal snow, that snow and salt is going to wash right off into the stream," Bruns said. "If, with a storm like this, they're taking it away, hauling it off to some bigger river, that might serve to dilute the salt and mitigate the effect."